Notorious friendships are nothing new to the art world. Generally speaking it's the ones that rise to the top that end up in our field of vision-- Patti Smith & Robert Mapplethorpe, Fischli & Weiss, Pablo Picasso & Diego Rivera, to name a few. When we hear their stories of tears shed, self doubt and all they had to overcome through the years- fame seems almost second hand, just another milestone in the journey as opposed to a motivational force behind all the struggle. People talk about the gravitas of great artists in our time as if to try and qualify or explain the inexplicable. But sometimes it’s the friendships and relationships themselves that offer a better understanding of the matter at hand. They offer a glimpse into the time they lived in and the idealism at the heart of the matter that is outside of the usual vernacular. Enter Hannah Black and Carla Perez- Gallardo. Two Generation Ys with 9 lives under their career belts- the cache of their potent blend of friendship, art and business is seemingly endless. Friends for ten years and counting- their burgeoning careers started out in art school- Hannah pursuing painting at RISD, and Carla focusing on installation art at Bard. Makers at heart, they expanded their talents serendipitously. Both needed jobs to pay the rent- and post graduation 2014, found each other while chopping bean sprouts and cilantro at a Vietnamese street food truck Hannah was running in the Catskills, NY. They happened to meet at a crossroads in their lives where the stars lined up and an Aries met an Aquarius at just the right moment. They were both trying to merge their need for a practical career plan, with their love for creativity and food. Following their chance encounter, the two talked about all things art and food, kept in touch, and continued to work together on various other cooking projects at Art Basel, in Brooklyn- and eventually in their own catering company Table Table. They came to rely on the support the friendship offered having found they both were going rogue in their career pursuits. One thing lead to another and the two found themselves forging a new direction away from the familiar confines of graduating from art school- introducing their mad skills to Hudson, NY. In 2015 Hannah and Carla took over the space the Hudson community had known as Debbie’s, a cozy salt of the earth diner which had been open for nearly 30 years prior. The pair developed a working friendship with Debbie herself, and following the inspiration from their love of the space’s pivotal role within the community, developed the idiosyncratic style of their brainchild, Lil Deb’s Oasis. The two took on the challenge of merging all of their myriad interests into the endeavor. They knew this was not just a working restaurant with overhead and back taxes, this was to become a living breathing entity; the yin to your yang, the ketchup to your mustard or the restaurant Hudson never knew they needed. 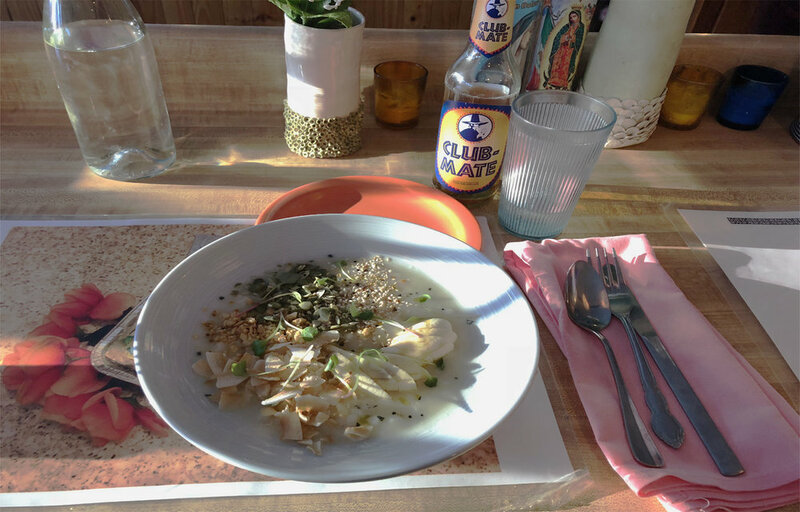 Not only is Lil Deb’s a great restaurant where you can eat amazing nutritious rarities for $10 or less, it’s also a beacon of positive vibes that the pair have gone out of their way to inject into the space. Some might say the space is zany or arty, indeed it is both of those things, however, genuinely- it is best understood only through their individual story they have reflected in their food, in their holistic ethos and in the staff they very decidedly care for. Nothing goes unnoticed at Lil Deb’s. Every detail is considered, from the delicious family meals prepared for the staff each day, the tipping out of the dishwasher, the hand made t- shirts or menus created by friends of the restaurant. However at the center of it all is the attitude towards the food itself. Technically speaking, Lil Deb’s is serving up “tropical comfort food,” or a delicate hybrid of all things inspired by the eclectic culinary delights of Hannah and Carla’s childhoods. Hannah with the southern charm of her native Alabama and Carla with her Ecuadorian roots; they challenge and inspire each other – throwing down in the kitchen like kids in a school yard, making up recipes as they go- bringing new life to classics with the idea in mind to always keep their food at a reasonable price point. For example, ceviche isn’t just ceviche, it’s an ever changing staple of the menu- worked and reworked like a diner’s daily soup. Or there’s the wine list, where a bottle of Emilia Romagna is described with a handful of words that read more like accessible concrete poetry than what can often be an intimidating list of information few people understand; “…jelly shoes, baby’s breath, negligee, primordial silt.” Time and time again, they go out of their way to reach people in a creative way; whether that be through making foods that are new or different to the Hudson community easy to afford, making wine less pretentious, or making the décor of their restaurant home spun and welcoming.